Carol's Theatre Reviews ~ It's Fun To Go Out: Composer Daniel Catán’s “Florencia en el Amazonas” Completes San Diego Opera Season. Composer Daniel Catán’s “Florencia en el Amazonas” Completes San Diego Opera Season. It was twenty -four years ago almost to the month that Mexican composer Daniel Catán’s opera “Rappaccini’s Daughter” made its U.S. debut at the Civic Theatre under the auspices of The San Diego Opera. 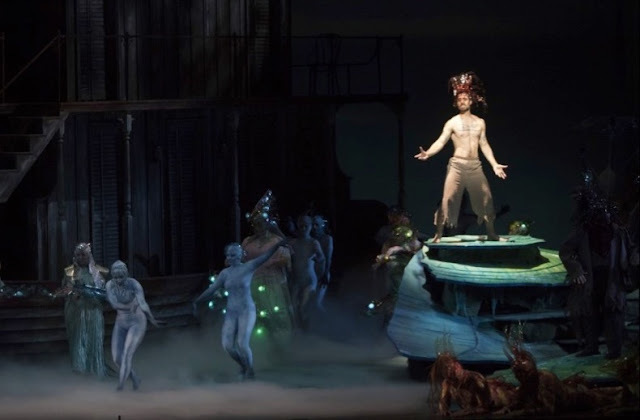 His “Amazonas” became the first Mexican opera to be produced by a professional opera company. 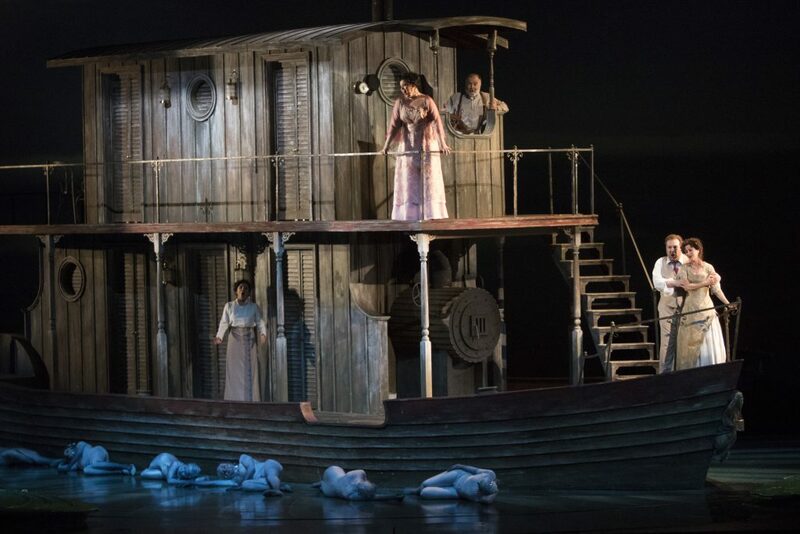 Now in a return visit with his “Florencia en el Amazonas”, the opera season winds down with another first; “Florencia en el Amazonas” was the first opera in Spanish to be commissioned by an opera company in the U.S. It premiered in Houston in 1996. 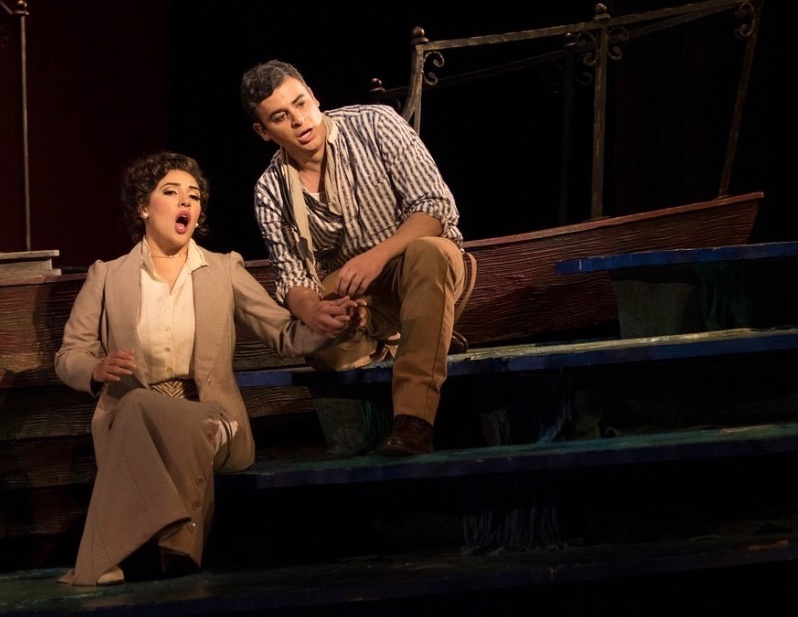 ‘Florencia’ with libretto by Marcela Fuentes-Berain and characters by Columbian novelist Gabriel García Márquez, (Based loosely on his novel ‘Love in the Time of Cholera) with the central character Florencia Grimaldi (soprano Elaine Alveraz), a famous opera star who is returning to her homeland in Brazil. Cast of "Florencia en el Amazonas"
She, along with other passengers, are on a steamboat journey making their way down the Amazon. She is engaged to sing at the opera house in Manaus; they hoped to hear her sing one more time. There she also hoped to connect with her former lover Cristóbal, a butterfly hunter who disappeared into the jungle. She hasn’t seen him in twenty years but still longs for those times. On the boat there are several other characters that fill in with a subplot that holds the story, thin as it is, together. Her interaction with the others is almost nonexistent. She broods and sings of her sadness and longing to meet up with her former lover. Her arias are beautifully executed but always soulful. It’s not a bad thing when you are listening to Alveraz’ gorgeous and soaring soprano voice but for the most part, she pretty much plants herself along the steamboat rails or stairway and sings her heart out. She was flawless on opening night but it all became repetitive after a while. Under other circumstances I could listen all day to her impassioned pleas of loneliness and hope. Her voice is simply stunning. But it does leave some void as far as the thinly veiled story is concerned. 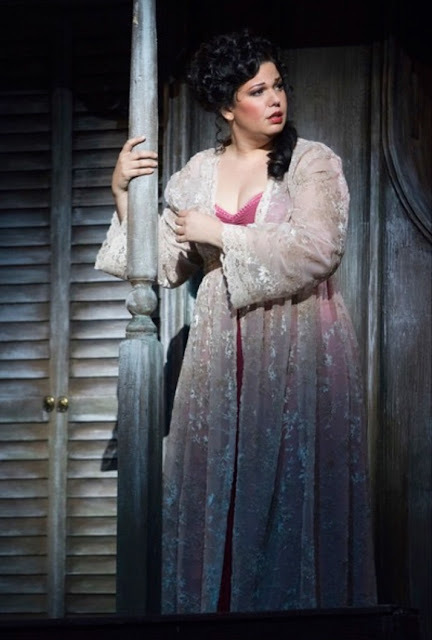 Desire to hear Grimaldi one last time connects those on the journey to her. That she is among them traveling in disguise is another matter. Everyone sings about her but no one seems to recognize her until much later. Rosalba, (Soprano Maris Frenenda Castillo is another voice with which to be reckoned) is a journalist planning to write a book about Grimaldi, and to her surprise and almost astonishment, she becomes enamored with the steamboat captain’s (Baritone Hector Vasquez is perfect) nephew Arcadio (Tenor Daniel Montenegro) who has somewhat of a jaded past but proves himself worthy after a storm grounds the ship. On a lighter side Paula and Alvaro (Mezzo-soprano Adriana Zabala and Levi Hernandez) appear to be the more mature and all too married couple along to hear Grimaldi sing. They bicker almost throughout about lost opportunities; pride and crisis adding needed levity to this all too heavy hitting piece. Zabala’s mezzo voice is beyond magnificent. Of the women she is the most animated and, I must add, the most three-dimensional. This is all on the human side of Catán’s opera. What fascinates, however is the dream like quality of the setting beneath the waters. 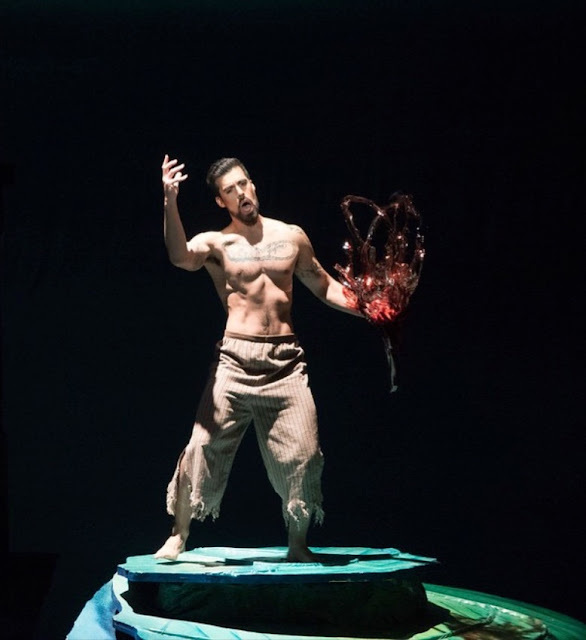 Ríolobo, (Baritone Louis Alejandro Orozco) the ships mate acts as both narrator and later shows up as one of the river spirits. His baritone voice is almost larger than the man himself, etched in tattoos, commanding in his head -dress and focusing all our attention to him. 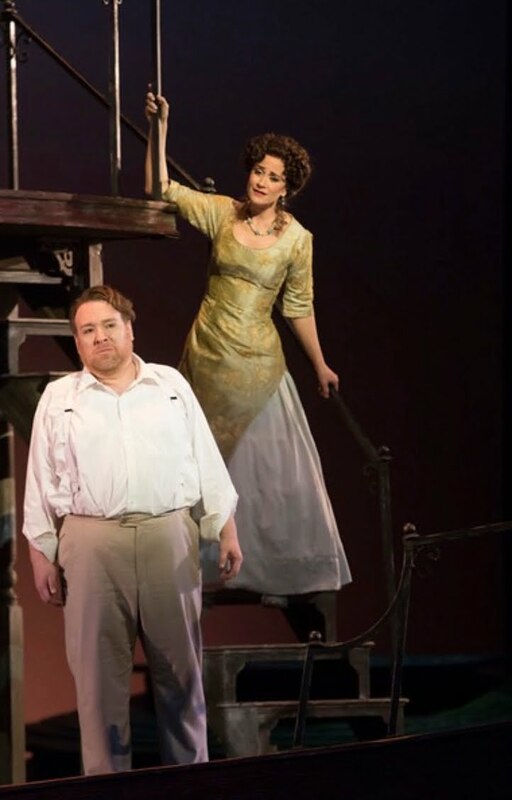 His rich voice is like a magnet and his wonderful energy makes up for the lack of it in the libretto. The magical scenes (Mark Frederic Smith) dimly lit by Todd Hensley set the eerie mood with Candace Evans direction and choreography, and Linda Pisano’s costumes that bring a fairy tale look to the under water creatures, which are in stark contrast to the light- weight linens of the earthly folks and the realistic and functioning two -story steam -boat that pretty much becomes its own character. The underwater dwellers rolling around next to the boat however were a major distraction to yours truly. Conductor Joseph Mechavich was in full charge of his orchestra that played flawlessly. Bruce Stasyna’s opera chorus was on top of their game, but there wasn’t very much for them to do. In Cátan’s “Rappaccini’s Daughter” poisonous plants become the focus of his attention. Now underwater creatures, a magical rainforest, sea nymphs, and butterflies pave the way for some rich arias, dreamy atmosphere and hope of new beginnings. Hats off The San Diego Opera for bringing new operas with quality and skilled musicians, across the spectrum, to our community.